WHR Rivers and Torres Strait Islander with the color wheel. In Richards, G. (1998). 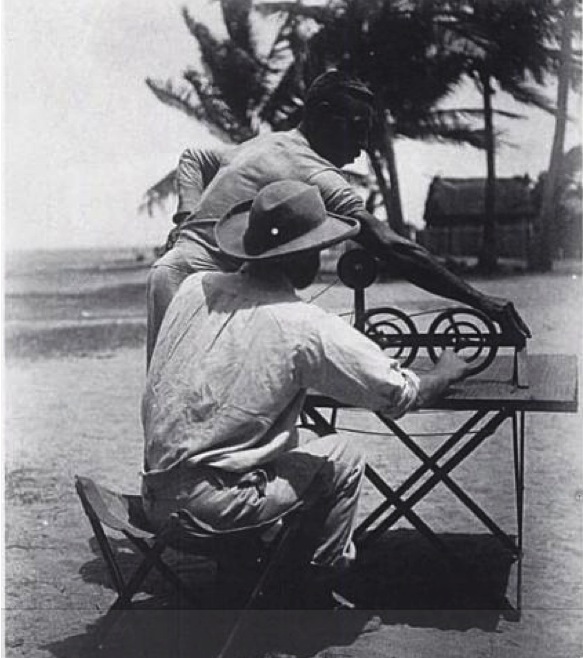 Getting a result: The Expedition's psychological research 1898-1913. Cambridge and the Torres Strait: centenary essays on the 1898 anthropological expedition. A. Herle and S. Rouse. Cambridge, Cambridge University Press: 136-157. A table is a technology that stabilizes people and things in space for a time. The table, with its chair, enforces a posture of attention to what is on it. 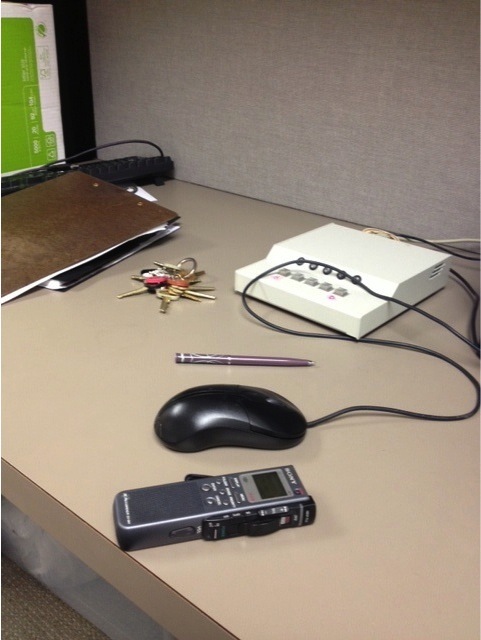 It permits display and use of other tools, and enables precise recording on paper. It also allows the display of disparate materials on the same plane in space. Bruno Latour explained the effect of this, as he watched botanists in the field arranging soil and plant samples on tables: “specimens from different locations and times become contemporaries of one another on the flat table, all visible under the same unifying gaze.”[i] The flat plane provided by the table enables the abstraction of dissimilar specimens into categories. Infrastructures like the table are not necessarily passive. Perhaps the table is even a kind of trap. Open and inviting a table might seem, but once you are sitting at it, certain forms of courtesy might serve to hold you there. Alfred Gell famously described a hunting trap as a device that embodies ideas and conveys meanings because it is a “transformed representation of its maker, the hunter, and the prey animal, its victim, and of their mutual relationship, which . . . is a complex, quintessentially social one. . . traps communicate the idea of a nexus of intentionalities between hunters and prey animals via material forms and mechanisms.”[ii] If the table can be thought of as a kind of trap to capture and contain a subject, it is a disarming one—it looks so placid and innocent, for something that has the potential for intrusion and control. Perhaps this is one reason it has largely gone without notice. Nor need the table, or any technology, only have one use. Think about dinner tables, seminar tables, and of course medical examination tables. Nor are such tools neutral in the play of gender dynamics: think of the “head” of the table, or “high” table, both of which provide a stage for social hierarchies. Now, at the table: How can we best understand the deep assumptions that govern the scientific method, particularly when it is applied to the human sciences? In particular, how can we identify epistemological assumptions that enable historically specific understandings of such concepts as number, measurement, conservation, time, space, or mass? Down through the ages, anthropologists have had their tables, once used to create an island of French culinary civilization in the Brazilian rain forest. 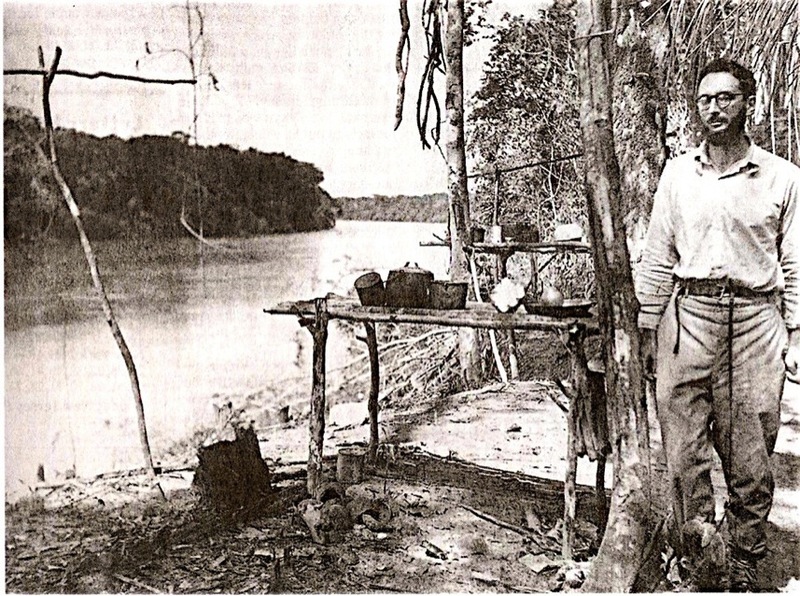 The photograph chosen to represent the ethnographic work of Claude Lévi-Strauss in his obituary showed him in a Brazilian rain forest standing by a table made of sticks lashed together. Laura Bohannan says that among the limited bits of advice given to her about how to do fieldwork in Africa, was this: “You’ll need more tables than you think,” a remark attributed to Evans-Pritchard. Claude Lévi-Strauss, Amazon rain forest ~ 1936. Edward Rothstein, "Claude Lévi-Strauss, 100, Dies; Altered Western Views of the ‘Primitive’." New York Times, November 4, 2009. Tables have also been used to corral thought, guide the reader’s mind along a certain course, as in the classic and often quoted examples from Plato and Marx. As usual, such tools do not determine their own use. “Table” is also a verb, as in “table it” in which the “table” holds items of business steady and unchanged in time. There are a myriad practices in meetings involving tables of all kinds, which exert a certain force in governing how matters proceed. Think of referring to “what is on the table,” “setting an agenda,” “laying a question on the table,” “taking a motion from the table,” and so on. By now you might be wondering why the graphic form drawn on paper, displaying data enclosed in columns and rows is also called a “table”! It might have something to do with early scientific collections, arranged in flat boxes divided up into little square compartments. Or perhaps the table as a graphic form derives from the medieval practices of counting money on tables marked with squares. The table — as a piece of furniture with a flat surface and legs — and the table — as a display of facts in columns and rows — might both trace their genealogies to the Latin tabula rasa, literally ‘scraped tablet.’ The tablet was wax, and it could be heated and smoothed (scraped) to yield the literal origin of the epistemological “blank slate.” Whatever the historical link between the two kinds of tables, they both remain intriguing forms of everyday technology, which guide and form our posture and attention so that we can become, instead of blank slates, stable human subjects in psychology experiments, in the classroom, or at dinner. In my current project tables are ubiquitous. Tables, with their chairs, keep one’s body in place. In all the experiments I participated in, the experimenter made frequent and repeated requests concerning tables: sit here at the table, pull your chair closer to the table, put your hand on the table, rest your hand flat on the table, arrange the keyboard conveniently on the table. And of course tables hold computers, monitors, keyboards, and recording equipment steady. In the contemporary lab, the place of the psychological subject in relation to the equipment is not open for debate. The subject sits at a table and yields data to the machines. Experimental table. Photo by Emily Martin. The table is so embedded in the experimental context that it escapes notice, even though without it the stability of the subject in space and over time would be difficult if not impossible to achieve. Once it becomes evident that the table is an active artifact in the production of knowledge, new possibilities for opening up the nature of the experimental space in psychology abound. Latour was right to say that “Laboratories are excellent sites in which to understand the production of certainty, [but] . . . they have the major disadvantage of relying on the indefinite sedimentation of other disciplines, instruments, languages, and practices. One no longer sees science stammer, making its debut, creating itself from nothing in direct confrontation with the world. In the laboratory there is always a pre-constructed universe that is miraculously similar to that of the sciences.”[iv] After a discussion of the table’s role in experiments, one of my researcher interlocutors began puzzling about what it would take to conduct an experiment about – say – memory in a crowded coffee shop instead of an experimental setting. This was disconcerting to him because leaving the laboratory would mean leaving a world of tables, flat, one dimensional, and still. But anthropologists should take note: even the busiest coffee shop has its tables too. Emily Martin teaches anthropology at New York University. She is the author of The Woman in the Body: A Cultural Analysis of Reproduction (Beacon Press, 1987); Flexible Bodies: Tracking Immunity in American Culture From the Days of Polio to the Age of AIDS (Beacon Press, 1994); and Bipolar Expeditions: Mania and Depression in American Culture (Princeton University Press, 2007). She is the founding editor of the public interest magazine Anthropology Now. [ii] Alfred Gell, “Vogel’s Net: Traps as Artworks and Artworks as Traps.” Journal of Material Culture 1:1, 1996, p. 29. Image: “Day 51: Division Board.” Flickr. Martin E. Table. Somatosphere. 2014. Available at: http://somatosphere.net/2014/table.html/. Accessed April 18, 2019. Martin, Emily. 2014. Table. Somatosphere. http://somatosphere.net/2014/table.html/ (accessed April 18, 2019). I really like the focus on the table– but perhaps table+ writing / inscription technologies to record the things that going on the table? yes, one without the other wd be useless! Actually I have worked in many field settings, and I never or rarely ever wrote on or at the table. Really lovely work on documents as containers and also as platforms. Reminds me of Sara Ahmed’s work on tables in Queer Phenomenology, and also Zoe Sophoulis’s discussion of container technologies and why they ‘escape notice’. I wonder is a field also a table?